My boyfriend and I are talking about doing some reenactment markeds – at some point in the future. We are talking about the possibility of going as spiced wine merchants. In the past I have made a spiced white wine, Lutendranck, which is really tasty. So when I had two liter of red wine sitting around and ran into a recipe for hypocras I of course had to try it. After making both I have started collecting different recipes for both wines. Hypocras (hippocras or hipocras, ipocras, ippocras) was a spiced wine that was served either hot or cold. Many different recipes for this drink can be found and there are quire a few sources with recipes. For once they even have measurements. There is always spices and sugar in there though – there tend to be cinnamon in the mix. The first recipe shows up at the end of the 1300’s. In Europe spiced wines go back Roman time and has been drunk since then. In northern Europe we still drink heated spiced wine for Christmas – though it is not normally sweetened. The wine is made by mixing spices (grinding them if need be) and mixing the wine and sugar and spices. Leaving it over night and then strain the wine. The result is a very spiced and sweet wine. To the modern diner it seems cristmasy because of the cardamom and cinnamon. I made the second version of the recipe because I had just gotten the unusual spices in the mail and wanted to test them out. To my taste it was a bit weird but I think with a few adjustments it can become rather good. Since the first recipe call for the mix to sit over night, that is what I did with the second version as well. I really need to make my self a cloth straining bag for making spiced wine – coffee filters are too fine to work well. I think cheese cloth might work well. The source is a danish doctor, Henrik Smith, from the 1500’s who wrote a book on cooking, herbs and medicine. In his recipe there are two versions. See both below. Here is the original source from 15771. Denne Drick Ipocras kaldies effter Ipocratem læge/ som først den paafant/ oc idelige brugede/ oc findis almindelige i alle Apotecker berede/ oc den skal saaledis beredis. Tag den beste Canel du kant faa/ halffandet lodt/ godt hvit Ingefær i lodt/ Galliga it halffit lodt/ støt disse småt til pulver/ leg det saa i it Glas/ lad der paa halfftredic potte god rød Vin/ oc Sucker saa meget/ effter som du vilt haffve det sødt til/ lad de saa staa en nat tilsammen. Somme giøre denne Drick saaledis/ Du tage fire lodt god Canel/ tu lodt Ingefær/ it lodt Paradiskorn/ it halfft lodt galliga/ Neglicker/ Muscate nøder/ Cubeber/ Cardemommme/ af hvert halffandet qvintin/ dem støde de smaa til pulver/ af disse Urter saaledis støtte tage de it lodt til hver halvlanden potte Vin/ oc it halfft pund sucker meller eller mindre/ effter som de ville at samme Ipocras skal vere god sterck oc sød til/ de blande oc Vinen Urterne oc Sucker tilsammen kaalde/ oc lade det saa løbe iginnen en Viden klarete seck/ der til besynderlige gjort. This drink is merry and precious beverage for old people, particularly for winter mornings, drunk on an empty stomach, warms the cold stomach and is good for the heart and all manners of cold tendons ailments. This is not a drink young people should drink, just for the heat of the drink. I have translated it and re-calculated the measurements to teaspoons instead of accurate measurements. You should see the Excel sheet. If you have a letter scale a teaspoon is about 2,5 g of grounded spices. The second version, which is the one I made, calls for some unusual spices that can be hard to get a hold off. I ordered mine online. If you can not get a hold of them, you could either make the first version of the recipe which is much simpler or you can do a bit of substitution. If you can not get Grains of Paradise I suggest that you use more cardamom. 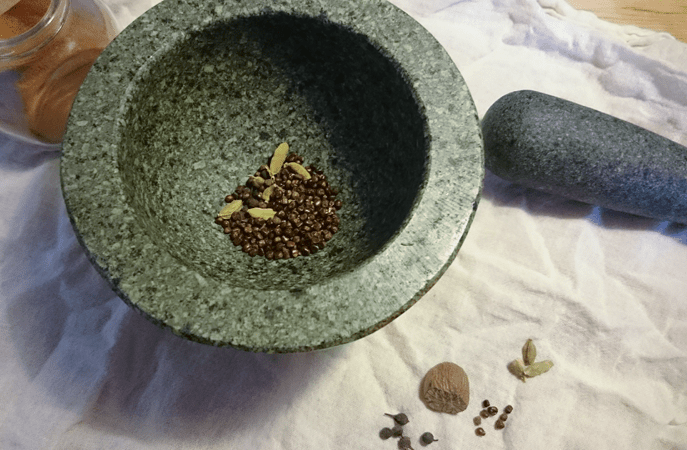 If you can’t get your hands on cubeb pepper using black pepper and perhaps a few juniper berries as the taste is somewhere between pepper and forest. The wine keeps for about a month before the taste has changed enough to makes it less nice. It is a good idea to heat a cup of wine with the sugar to dissolve it. Mix it with the rest of the mix. Mix the spices and the wine. Bottle the wine. The wine is drinkable right away, but I think it taste better a few days after it is bottled, as the taste becomes rounded and less sharp. The wine keeps well in a closed bottle. Heat a bit of the wine and dissolve the sugar in the hot wine. Mix that into the rest of the wine. 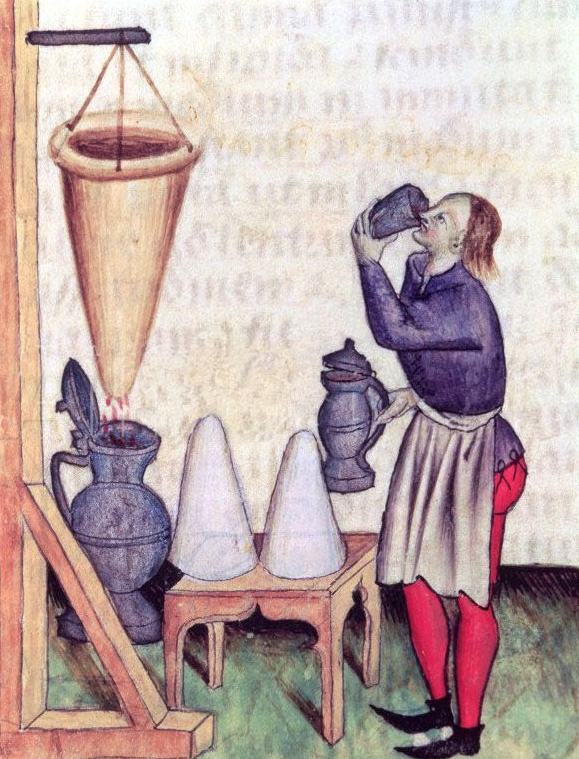 A medieval spiced wine that was popular way up until the 1800's. This simple version of the recipe is really easy to make and quite tasty. This is a fortified version, where cognac has been added. This is also a version of doctor Henrik Smid recipe. Source: Den Gamle By. Modified version of doctor Henrik Smid's recipe in "En skøn lystig ny Urtegaard…"; Malmø 1546 og printed Rostock 1599, page 155-56.